A module, truly like none other; a genuinely funny, yet gritty adventure...with half-dragon-sheep! Yep. This is exactly what it seems like. Wooly death! The second LG BK Classics module clocks in at 30 pages – 30 pages of content, that is (covers etc. already accounted for) – one of these is devoted to a regional map, and 2 handouts for players are included, so let’s take a look! This review was moved up in my reviewing queue at the request of my patreons; it was further moved up in my queue due to me receiving a print copy of the module. My review is primarily based on the softcover print version. In case you’re new to the work of Casey Brown – the author is one of the masters behind the by now legendary Bandit Kingdoms adventures for the by now, alas, defunct Living Greyhawk campaign. Even within the context of that living campaign, back long before Arcanis or Pathfinder Society, the bandit kingdoms were special, emphasizing a gritty, old-school dark fantasy aesthetic firmly rooted in D&D, it seems to have been a classic in the truest sense of the word. With the end of Living Greyhawk, those legendary scenarios evaporated. Being a German, I wasn’t even aware of their existence until I got to read the campaign summary of these adventures, and if anything, the Unofficial Living Greyhawk Bandit Kingdoms Summary (linked here and below on my homepage) made me bemoan the fact that I never had the chance to participate in that campaign. Well, turns out that sometimes, wishes do come true. The author has begun reviving the classic Bandit Kingdom adventures for a proper, wider audience, updated and streamlined. The modules may be bereft of Wizards of the Coast IP, but they still are decidedly examples of the same, gritty Greyhawk-atmosphere that old-school gamers and folks like yours truly have come to love. If you’re not an old-school gamer (hey, quite possible, considering how long it’s been since there’s been any serious support for Greyhawk! ), and are familiar with Pathfinder’s 3pp-circuit, think of the flavor evoked by Raging Swan Press and the more subdued Frog God Games adventures. Raging Swan Press is a slightly closer analogue, considering Creighton Broadhurst being another Greyhawk alumnus. This module could be considered to be linked in a way to the “Blue Scales, Red Secrets” adventure, which introduced one of the most famous threats of the Bandit Kingdoms to the PCs…but fret not, this module per se works perfectly as a self-contained module and requires no knowledge of said adventure. This adventure was designed for 4-5 level 3-5 characters, but unlike many modules, it does offer actual notes on how to handle scaling individual encounters – not global stuff, mind you, but individual modifications. The module uses footnotes to explain trivia where required, and indeed, can be considered to be basically a go-play module. If you’re a moderately experienced GM, you can run this adventure without any serious prep time; potentially even spontaneously – there is but one prep work to potentially be done, and that pertains a battlemat. And guess what? The module ACTUALLY has guidelines for that. I kid you not. It achieves this ease of usability, at least partially, in two structural decisions: The first would be mechanical transparency that exceeds what you usually get to see: For example, the settlement statblock of the starting settlement has its individual skill-modifiers due to Crime, Corruption, etc. explained in a footnote – on the same page. No page flipping required. While the module does reference NPC Codex NPCs for town guards and similar characters that the PCs aren’t meant to enter combat with, all immediately and likely to be used mechanical components are included. This includes a spell-variant, a reference to a mythic feat and the like – you generally won’t need to flip books with this. Secondly, it should be noted that even GMs not used to running complex encounters or playing up NPCs get guidance via read-aloud text far beyond what one would assume in the module, beyond what is customary. This makes the adventure pretty friendly for GMs less proficient in the improvisation of flavorful read-aloud text. It should be noted that this is very much a ROLEplaying module – social skills are genuinely helpful, and while there is plenty of action, there also is some serious use for skills beyond that. All right, this is as far as I can go without diving into SPOILERS. Potential players should jump ahead to the conclusion. Okay, only GMs around? Great! So, we join the PCs as they are celebrating in the hamlet of Ankheg Springs (settlement statblock included), the festival of Lammas, to be more precise. With gatherin information entries and even a small dedicated shopping section, the pdf starts idyllic enough – and yep, even here, we can see Diplomacy, factions available, etc. – the information is more detailed than you’d expect, and indeed, generates a sense of being alive. The PCs even get to participate in the local tradition, which is basically ankheg egg hunting. This is risky and may pit the PCs against desert ankheg variants – and if the PCs botch things, they may get food poisoning from rotten eggs. As a further example of how detailed this is – the module does provide rules for food poisoning. Depending on how much your players enjoy RPing here, this all may make for the first whole session, in spite of not taking up that much space. Still, it’s fascinating to see that a few well-written pages can have this effect. The organic climax for the end of the prologue section is heralded by the entrance of a weird man – muscular, exceedingly good-looking man with blazing, blue eyes, a red mane and predatory eyes enters the inn and heads straight towards the PCs. In case you did not expect it – this man is no mere mortal. In fact, he pretty much makes no pretense of who he really is…and that he has a job for the PCs. He is, of course, one of the most deadly dragons I’ve seen statted in a commercial module – he is none other than the charmingly super-deadly red dragon called Morginstaler! His offer is simple – act as his couriers, or he will wipe out the PCs and the whole town of Ankheg Springs just for the hell of it. The dialogue with the dragon in-not-so-cognito follows a course that the PCs probably did not expect: Morginstaler (whose human form btw. only clocks in at CR 19 – and yes, PCs can piss him off…) asks them to deliver a love letter to the Floating Lake, which is situated within the Baleful Forest. Charming. So, the PCs have been made cupids, handed a letter by a mighty dragon…what’ll they do? The letter is sealed, arcane mark’d and secured with improved alarm. And guess what? Unlike most modules, this one actually talks in detail of what happens if the PCs get smart – with uses of erase and similar tricks – after all, many a group will be very much tempted to try to read the letter. (As an aside: If you have a bit of wax and a seal, you could duplicate the seal easily with 5 minutes of prep-work – that adds another level to the handout provided. (Yep, the letter’s one of the handouts.) There also is a rather hilarious scene as the dragon leaves, wherein a mighty duidess bursts into the tavern, attempting to “save” folks from Morginstaler, who even laughs about her prowess. This not only establishes further the power of the dragon…it also makes him oddly relatable. The druidess, Bellamoh, has a sidequest for the PCs. Morginstaler spent the night at an inn, and now strange things have been happening. The terrorized farmer points the PCs towards the barn – their task: Slaying the monster, preferably without burning the whole barn to the ground. 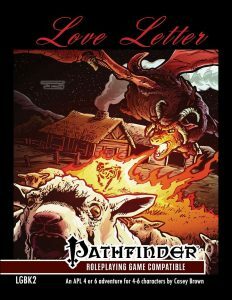 Fire spread, if any, as well as smoke inhalation are fully depicted for your convenience, as the PCs get a chance to find that Morginstaler’s notorious lustfulness and virility are no mere tales – they get to duke it out…with half-dragon sheep! This made me laugh so incredibly hard, particularly considering how, at one point during 3.X, slapping half-dragon on everything was a go-to-mode to make things “kewl”; this may be a deliberate lampooning of this era in gaming, or it may be funny for its own sake, but I wager that very few groups will not start guffawing when they realize a) that the horrid monsters are half-dragon sheep and b) how these sheep came to be. Wanna know how detailed this is? The pdf has actual rules for making the pelt of these sheep-monsters into magic items. And suddenly, that cloak of greater resistance has an utterly hilarious story that the players will always remember. It’s a small thing, but an approach to adventure-design that I’d love to see in more adventures. In the aftermath of this encounter, the PCs will have a chance to riddle the druidess with information on Morginstaler and the path/the quest the PCs got – and she does caution the PCs about the path being fraught with peril. The path will bring them dangerously close to the Fleshreaver Keep – at least if they want to make Morginstaler’s deadline. This keep, lair of mighty Cambion who conquered Riverton – and indeed, when the PCs move through this area, they will have to brave giant apocalypse locusts and swarms of them – even when steering clear of the keep itself. Dealing with a mythic menace makes for a challenging encounter here…but if the PCs survive, they can harvest its venom. Yep. They can. All stats included. Are you starting to see what I mean by details? How these details help generate a sense of plausibility in a module that has half-dragon sheep, just because an NPC has a twisted sense of humor? Yep, this is unique. This sense of wonder remains in effect when the PCs arrive at the Baleful Forest (which is btw. enhanced by aforementioned GM-aid-sequence) – here, a giant centaur with a fun accent (he’s half centaur, half dryad – don’t snigger!) can provide some words of advice – like warnings from the deadly ettercaps, of a lich…and the fact that there is, ya know, more than one dragon here. Yep. The PCs get to deliver a “love letter” to a dragon. (This is one minor nitpick – the dragon lady recipient of the letter has a changed type, which makes the green dragon behave more like a black one, but I don’t think that many folks apart from guys like me will mind – and in doubt, a GM can always rationalize this as a peculiarity of the dragon or consequence of the influence of the forest.) Anyways, negotiations can well take a turn for the really deadly, when the green’s mom rises from the lake…turns out that some things obviously transcend species, including parental disapproval for girls hanging out with “bad boys.” The PCs will need to get away from a REALLY angry mom…a true…dragon! Get it? Sorry, but the humor here is just awesome – enhanced, once more, by the copious amounts of dialogue-options. Editing and formatting are top-notch, I noticed no serious glitches on a formal or rules-language level. Layout adheres to a two-column b/w-standard, is player-friendly, and the interior artwork is fitting b/w-stock. The softcover has an elegant, matte cover. The pdf has bookmarks, just fyi. Casey Brown’s “Love letter” is utterly unique. If I had to sum it up, I’d call it a gritty, down-to-earth dark fantasy adventure with killer half-dragon sheep and multiple end-game level characters that is situated in a world that feels very much alive in that the PCs can die horribly…how the heck does this juxtaposition work so well? How come that, in spite of all of the mighty beings herein, the module doesn’t feel as linear as its structure actually makes it? The answer is simple: Writing and attention to details. From the dialogue options to how loot is handled, from the humor to the threat-level, from the hazards to the critters, this adventure perfectly manages to blend subject matter you’d expect in a high fantasy gonzo game, and makes it MORE efficient, because it grounds it in the tangible quasi-reality that the previous modules penned by Casey Brown have shown already. This humble module feels like none other I’ve read. It practically demands for the GM to further elaborate upon the cool characters introduced here; it features some of the most sympathetic and yet dangerous depictions of the apex predators that dragons are that I have seen in any module; the dragons herein are not simple hack-fodder, nor are they god-like monsters; they are apex-predators, and in the hands of a capable GM, this module can drive the sense of being a mouse staring a hungry cat in the eyes very well. If that cat was magical, smarter, and had a wicked, capricious sense of humor. In case my review did not drive that home – I adored this adventure. While the subject matter may sound like something that folks that usually go for gritty games dislike, believe me that this somehow actually manages to retain the flavor I’ve come to love in these modules, this sense of groundedness. This is genuinely funny, unique and definitely a module your PCs will remember; in many a way, it almost feels like a DCC-adventure, in how it allows even low level PCs to dabble with potent forces and have a serious impact on the region. My final verdict will be 5 stars + seal of approval. There is also one thing: I have genuinely never read a module that hit these notes, achieves this flavor – and at this point, this is a truly daunting achievement. This is a small adventure with a grand scale, and it pulls off novelty, a genuinely unique take fabulously…and represents perhaps one of the best examples I’ve ever read on how to make something I usually despise, namely a relatively linear adventure, actually filled with choice and engaging; of making a relatively linear module that should structurally be a railroad par excellence instead of being boring and hostile to player agenda, deliver an amazing story. Deliver choices – from accounting for PC capabilities to respecting choices in all the details. I thoroughly respect and enjoy this attention to detail, this respect towards the cleverness of players. Since my list is a reflection of my personal tastes, this does get a nomination for my Top Ten of 2018 – it’s frankly a great example on how to make a module like this work. You can get this amazing little gem here on OBS! You can get a massive bundle of these BK-style adventures here! The Bandit Kingdom Summary (not required for your enjoyment, but an interesting read!) can be found here!